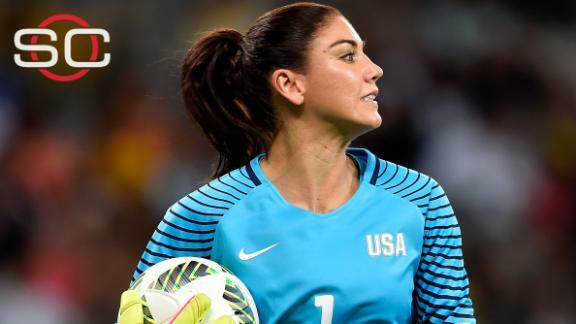 Goalie Hope Solo has been suspended six months from the national team for what U.S. Soccer called "conduct that is counter to the organization's principles." After the U.S. was eliminated from the Rio Olympics earlier this month in a penalty shootout, the 35-year-old Solo criticized the winning Sweden team, calling it "a bunch of cowards." "The comments by Hope Solo after the match against Sweden during the 2016 Olympics were unacceptable and do not meet the standard of conduct we require from our National Team players," U.S. Soccer President Sunil Gulati said in a statement Wednesday. "Beyond the athletic arena, and beyond the results, the Olympics celebrate and represent the ideals of fair play and respect. We expect all of our representatives to honor those principles, with no exceptions. "Taking into consideration the past incidents involving Hope, as well as the private conversations we've had requiring her to conduct herself in a manner befitting a U.S. National Team member, U.S. Soccer determined this is the appropriate disciplinary action."